We took the time to carefully develop the App, really focusing on making it efficient & easy to navigate. To log in, users simply enter their existing Rapid Responder username and password and are brought to a pin page where they will enter a new pin and confirm it. Once this process is finished, users will only need to enter their pin to access Rapid Responder via the iPhone App in the future. Once in the app, users download their sites using the menu icon in the top right corner, and within minutes, all available sites are downloaded and accessible to the user. 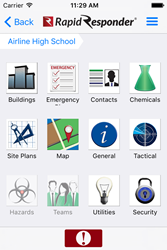 Because the iPhone App was built with functionality and congruency in mind, app users will notice icons without data are greyed out in an effort to minimize confusion and save time when locating specific information. Like other Rapid Responder apps, the iPhone App is integrated with Easy Alert, allowing for quick communication during emergencies with other Rapid Responder users. “Our goal is always to offer our customers with products that will help them meet their needs,” says Tobey Bryant, Chief Executive Officer for Prepared Response, Inc. “The iPhone App is something our customer have been asking for and we can finally give it to them. Prepared Response always offers our customers the most cutting edge technological features." The Rapid Responder iPhone App offers a new app feature, allowing users to view and access the same IP cameras that are integrated with Rapid Responder. The iPhone App is accessible without internet or Wi-Fi connection; however downloading and updating sites, viewing live camera feeds, and accessing Easy Alert can only be done with an internet connection. Rapid Responder is SAFETY Act certified by the U.S. Department of Homeland Security and puts critical building and site information at the fingertips of first responders, saving valuable time when every second counts. The system can be accessed via the internet, installed on a laptop, stored encrypted on a USB drive, and/or iPad and Android App. The emergency response and crisis management system has been used successfully in active shooter situations, bomb threats, lock downs and other emergency situations, across sites such as schools, hospitals, places of worship, and government buildings. It is currently deployed in over 16,000 facilities nationwide. Prepared Response Inc. is the leading innovator of emergency preparedness and crisis management solutions in the nation. For over a decade, Prepared Response has provided industry leading technology and consulting services that have been proven to save lives and mitigate property damage. The company’s flagship product, Rapid Responder, is used by over 1,300 public safety agencies nationwide and is SAFETY Act Certified by the U.S. Department of Homeland Security as a Qualified Anti-Terrorism Technology, along with being endorsed by the National Sheriffs’ Association. Rapid Responder is currently deployed in educational facilities, public buildings, critical infrastructure and private facilities across the U.S. The privately held company is headquartered in Kirkland, Washington. Additional information can be found at http://www.preparedresponse.com or by calling 1-866-862-7741.